Hey all! While Rebecca continues to recover (holy swollen ankles, poor girl) and we begin to get into some routines for E, posting here might be light. I’ve been trying to post daily pictures of Easton over at Macky&Co, so certainly check it out! For a side, but not so much fun, note — the other night, our upstairs AC unit crapped out. Fortunately, our downstairs unit remains cool. It should be another day or two until the unit upstairs gets fixed. We’re avoiding the upstairs like the plague. And when it rains, it pours. While Rebecca was breastfeeding the other night, we heard a huge BANG! and THUD! come from our bedroom at 3am. After running upstairs and nervously freaking out thinking someone broke in from the roof (for reals, I had 911 pre-dialed on my phone), I was able to realize that my side of the closet organizer collapsed. Yes, collapsed. I’m not sure how it happened or where the weakness began, but this thing took a tumble. 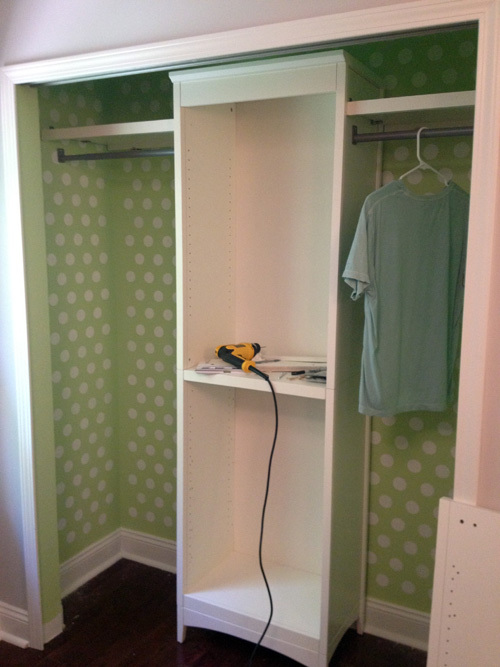 About half of the unit was evenly drilled into studs (more so than the recommendations in the manual, too) with the remaining as drywall anchors. Not cool, every last screw was ripped from the wall. So once the AC is repaired, I have a bit of cleaning up to do followed by reinstalling a new closet unit. Fun. Easton has been an absolute joy to be around, so we haven’t wasted much energy worrying about the above. We’re only a week in with him and I can barely remember what life was like before him. And it’s been incredibly awesome how great the cats have been. They’re not stressed at all and are always trying to interact with him, too! Guess who arrived on Wednesday May 23rd at 12:05pm! Easton Max did! 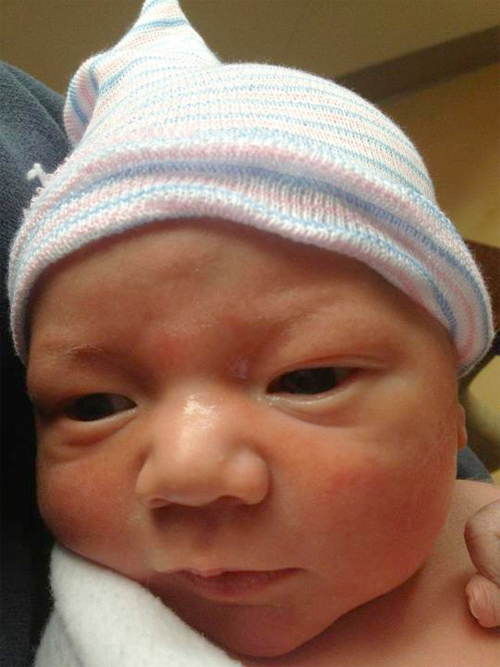 After hours of labor for Rebecca, Easton decided to make his grand entrance into the world. He arrived 21 inches long and weighing 8lbs 8oz. There is no back story to where we came up with the name Easton. Rebecca mentioned it one day and it just made sense for us. As for the middle name Max, well, Max was my first name choice before Rebecca mentioned Easton. But after some trial runs saying Max out loud, Macky would always come running towards us with his ears back. Poor guy kept thinking we were calling him, so we couldn’t confuse him by naming this kid Max. After all, Macky is the only cat in the house that actually knows his name. Rebecca and Easton are doing well. We are all trying to get into routines and what not, so it might be some time before we really get back into posting. 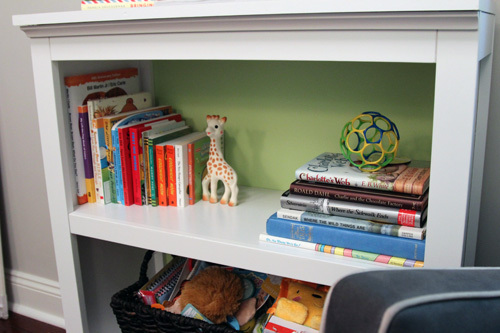 We have some great nursery pictures and stories to share with you all, so stay tuned! Oh and by the way, who thought boy all along? I didn’t put anything on it but a fan to keep me cool while working in there because I knew it would all eventually have to be removed anyway. 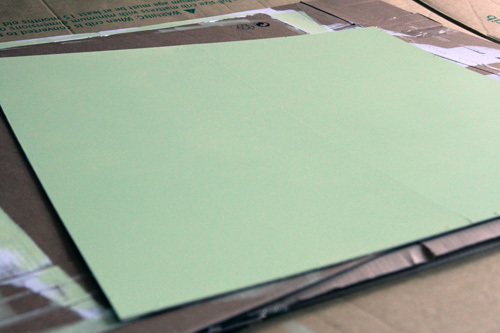 The problem was that the almost cardboard-like back was absorbing the paint. The first coat of green we put on literally disappeared. Mike ended up having to use 2 coats of the Valspar high performance, low-VOC primer that we used on the unfinished wood boards on the paneled wall. 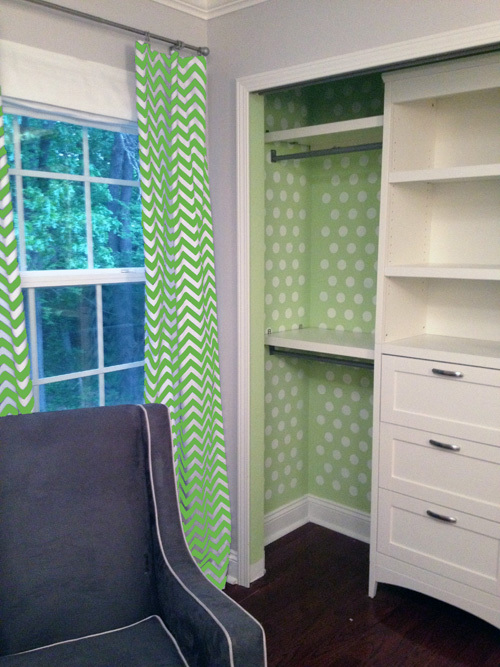 After those 2 coats of primer, we were able use the same Olympic zero VOC paint we used for the closet (Lettuce Alone B68-3)… but we still did about 2-3 coats of that to get to the level of green we wanted. Needless to say, between on our other projects and whatnot going on, this whole multiple coat process took us a while. 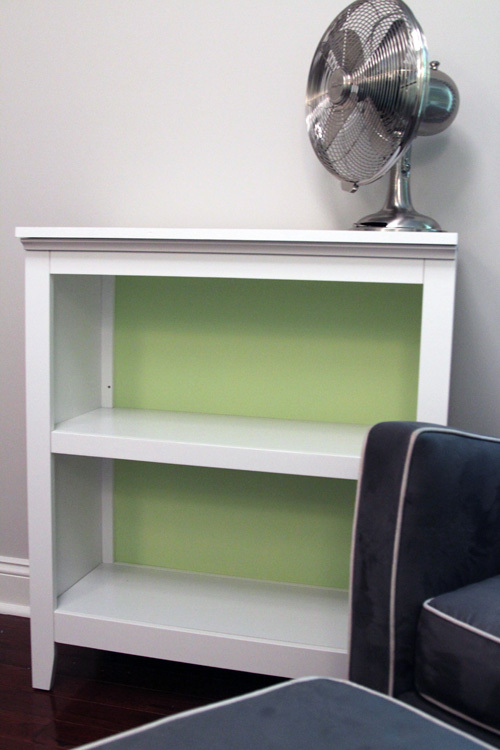 Finally on Friday, we were able to attach the back to the bookcase! It turned out so adorable and I wasted no time filling her up! The top shelf holds, well, books. And the bottom shelf holds a basket full of toys. If only I could keep the toy collection limited to what fits in this basket. 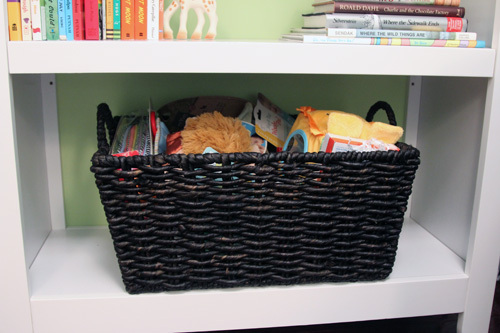 It’s already exceeded the basket and takes up a drawer in the closet, as well as an additional storage bin of older aged toys in our spare bedroom. 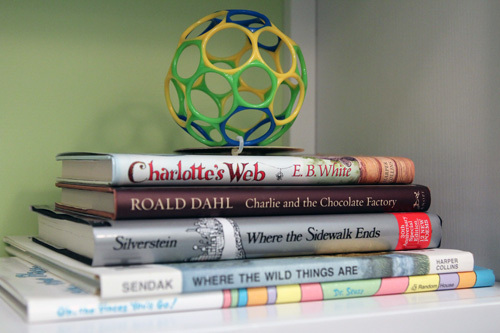 When we realized that we haven’t even bought our child a single toy, nor did we register for any, we realized we need to start working on that playroom ASAP! Mike literally started working on the new office again yesterday so that we can have the old office for baby gear storage. Clutter is my arch nemesis. 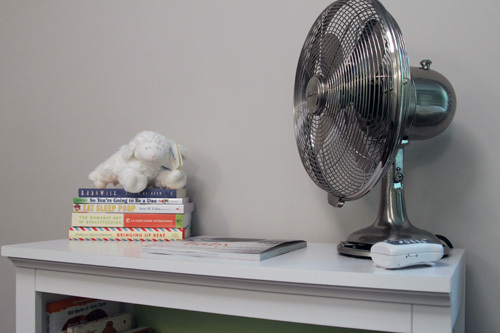 The top shelf of the bookcase holds our adult books and that fabulous fan. 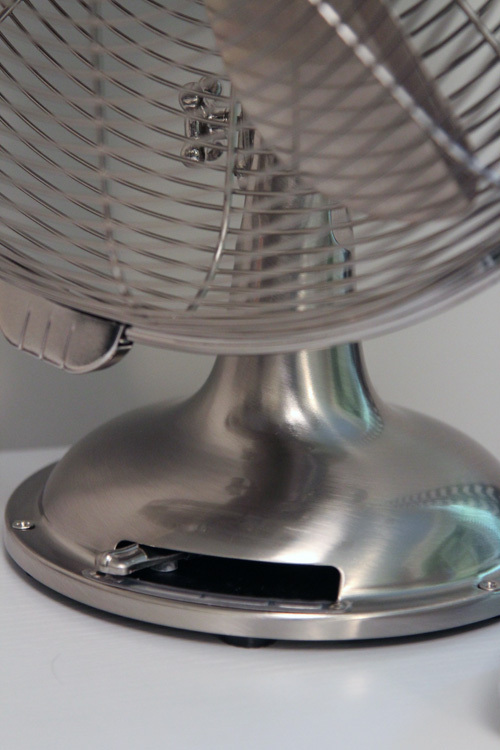 I love this fan because it’s 100% metal, even the switch to turn it on and off. 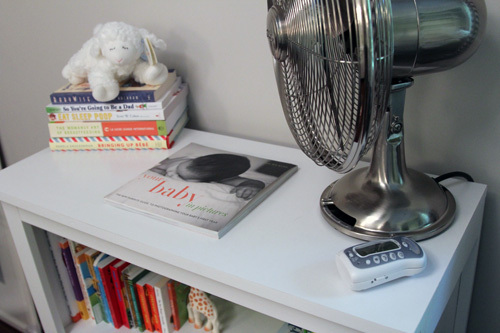 It’s the Hunter Classic Table Fan from Target. 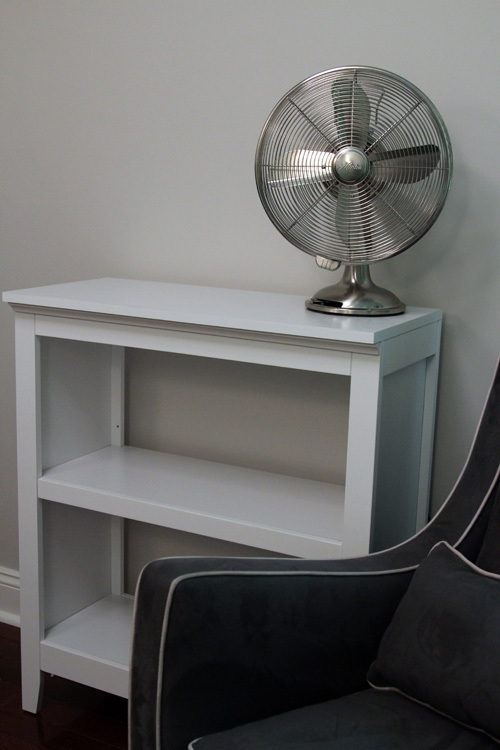 Next up is to come up with a gallery wall design to hang over this little bookcase. Off to Michael’s now to search for one part of it so hopefully I can get an idea of an arrangement today! ps- Yes, still pregnant. 41 weeks tomorrow. pps- Sorry if you tried to visit on Friday or Saturday and the site was down. Apparently there was a server upgrade we weren’t aware of that took for.ev.er. to fix. 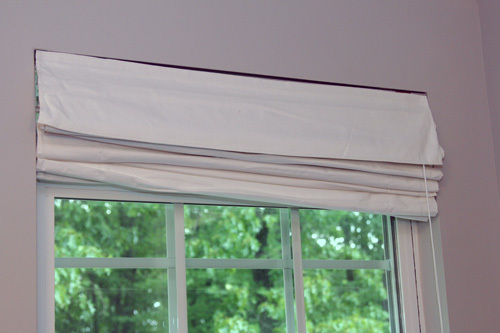 We’re not newbies to roman shades since we have them throughout our entire downstairs. Something about this was not bunching right. 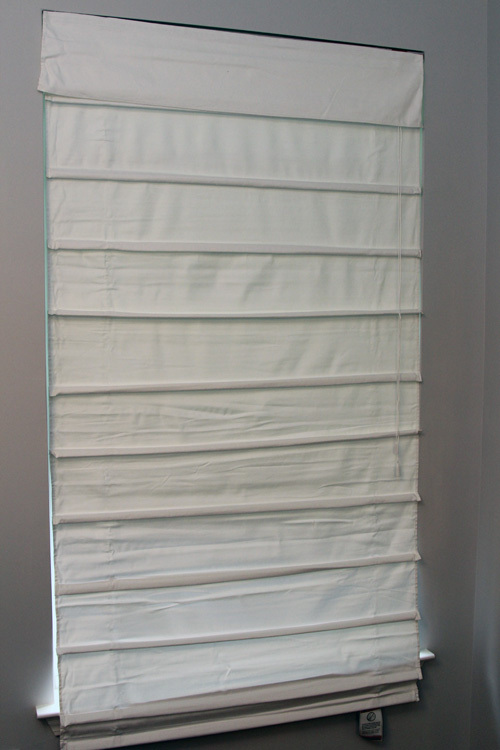 All of the Allen + Roth shades we have downstairs fold completely flat. The only thing we could think of is that it needed to be steamed. 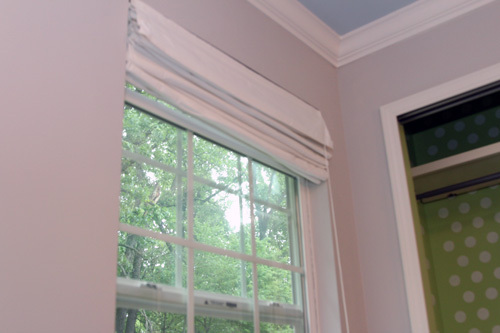 It is a different shade than the others and has many more folds because the windows upstairs are shorter. 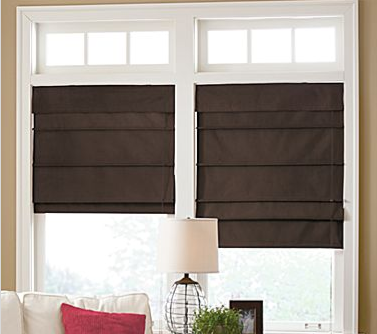 We would have went with our trusted Allen + Roth roman shades from Lowe’s if this window was 72″, but it’s 64″ and Lowe’s doesn’t sell those particular shades in shorter sizes. So I decided to attack it with the iron. I couldn’t get all of those wrinkles out (and I was worried about the plastic loops melting or something if I took it down and ironed it), but it does look better than the picture above. During the past week or so, Mike and I have been busy chipping away at nursery projects. So busy, in fact, that we have way more to blog about than we have left to do. 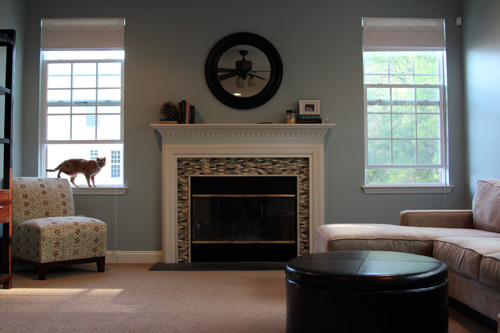 It’s so amazing and exciting to see the room come together and I am itching to share everything. 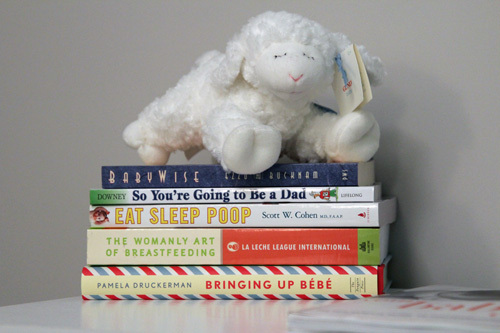 Right now, we’ve been focusing on getting everything done before the little one is here. With each extra day we get comes a new opportunity to tackle some projects. 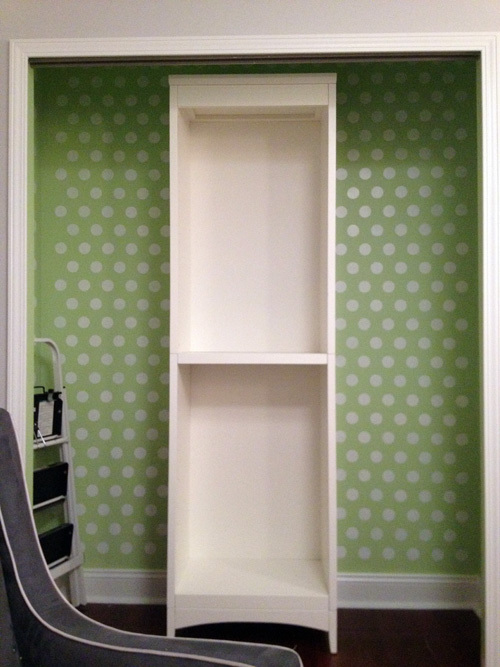 Right around the time Mike finished installing the giraffe sconces, the missing closet piece arrived. They sent us an entire new panel for the screw/bolt part we needed. 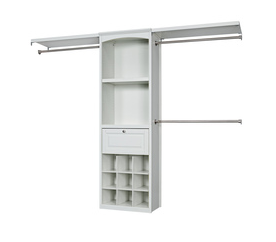 In case you need a refresher, we bought an Allen + Roth premium wood closet system from Lowe’s. 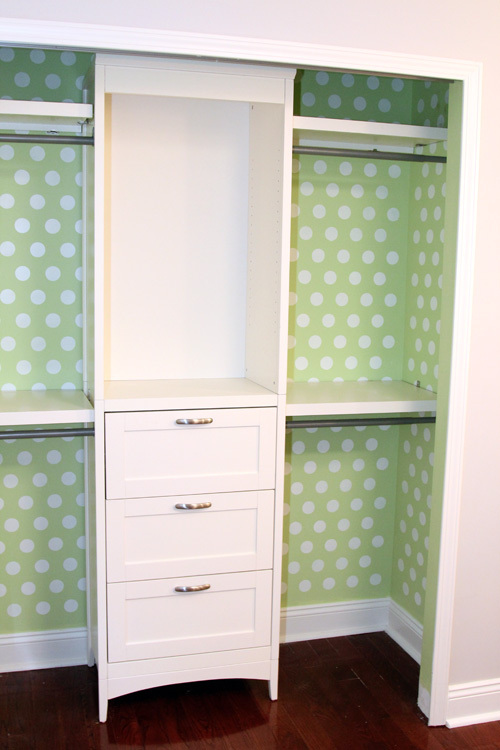 We have a similar version in our master closet and love it. 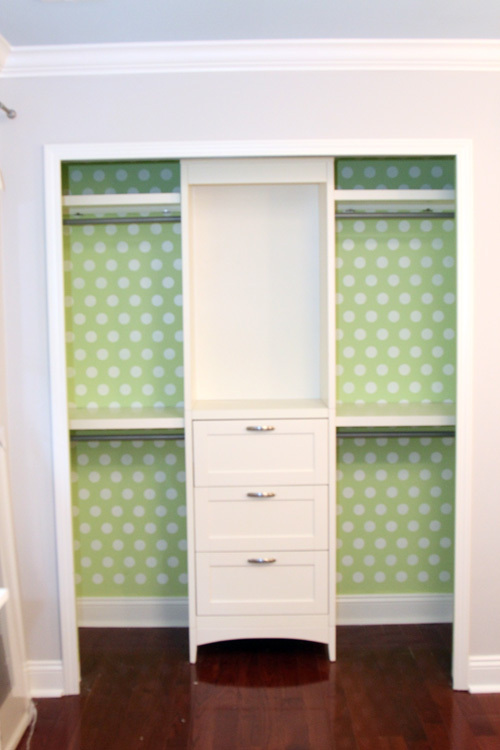 In our old place, we used some inexpensive Closetmaid organizers that ended up falling apart on us. Like, I literally pulled open a drawer one day and the entire front came unglued. Since then we stick to the solid wood products from Lowe’s. 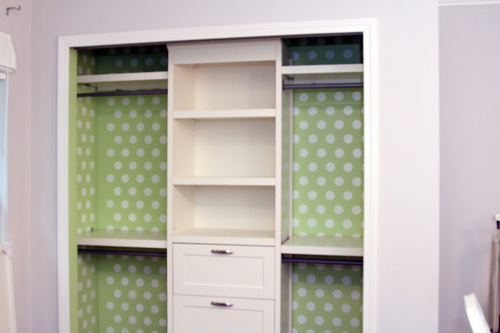 We can cut the shelves down to whatever size we need and customize all of the configurations. Mike got to putting together the center tower right away. Then, being the rocket scientists we are, we had to figure out how to get the tall tower into the actual closet. It took a few tilts and laughs, but we got it in. By we, I mean Mike. I pretty much sat in the glider through the whole process, snapping pictures with my iPhone. Please note the white paint all over my pajama pants. They were the victim of the spilled tray of paint while I stenciled the closet. After we got the tower in, we went back to Lowe’s to pick up some shelves. We needed 25 inch wide shelves on each side. 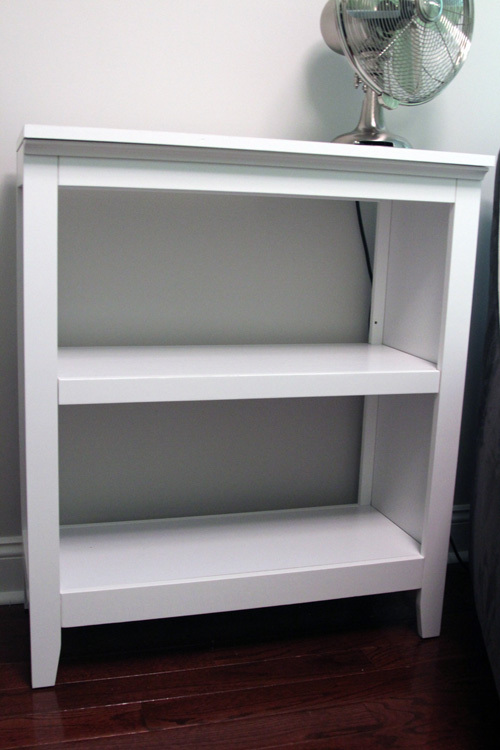 The shelves came in 21″, 48″ or 72″. None of those options were ideal. We literally scratched our heads in Lowe’s forever trying to figure out how we can pull this all off. Another problem was that the clothing rods Lowe’s sold were too large. We checked some of their other brands and saw some expandable rods that were 24″-36″, but they were in white. 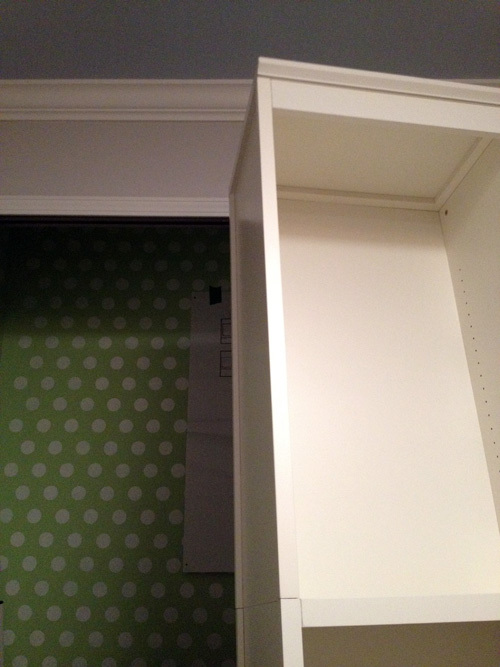 To save some money, we decided to only get one of the 72″ shelves and just do shelves over the top rod of the closet. We went to Home Depot to see if they had any chrome rods that would fit the 25″ we needed. Thankfully they did! 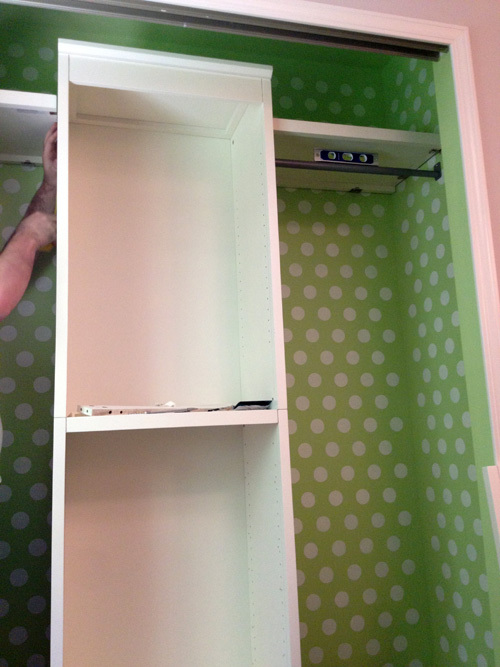 We got home and Mike cut 2 shelves to 25″. He installed them with some brackets, anchoring them to two walls and the tower. Just below each shelf, we put a clothing rod. To gauge where we wanted to put the next level of rods, we grabbed one of Mike’s shirts for some scale (since baby clothes are so tiny). Then we decided something. 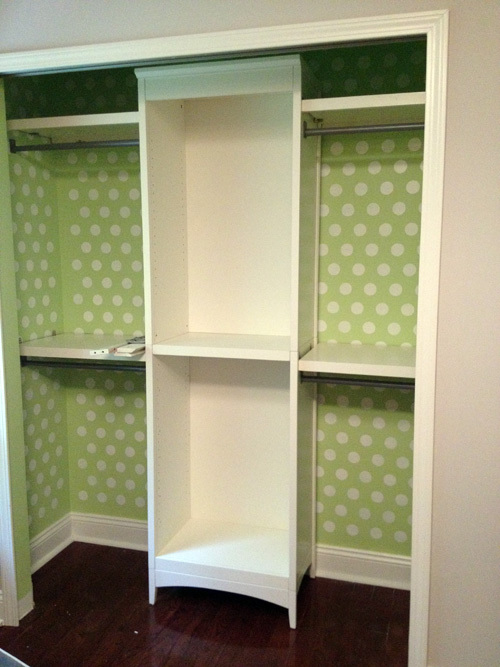 Since baby clothes are so small, we decided we DID want to do that second level of shelves. 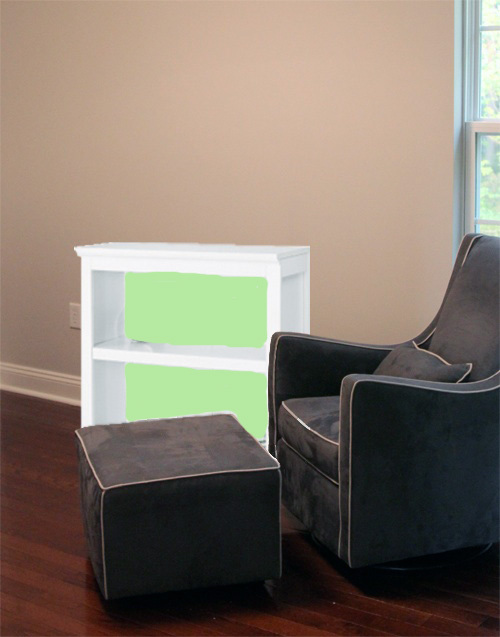 We knew it would look better and give us a place to put little shoes and stuff. 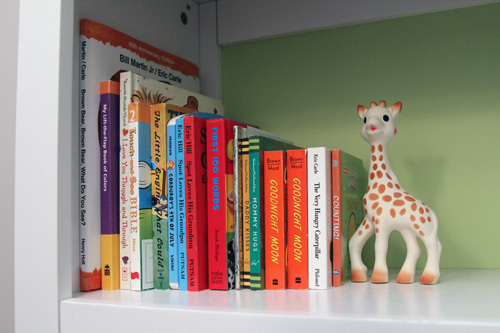 We know for an adult a shelf might not be practical, but it can always be removed. 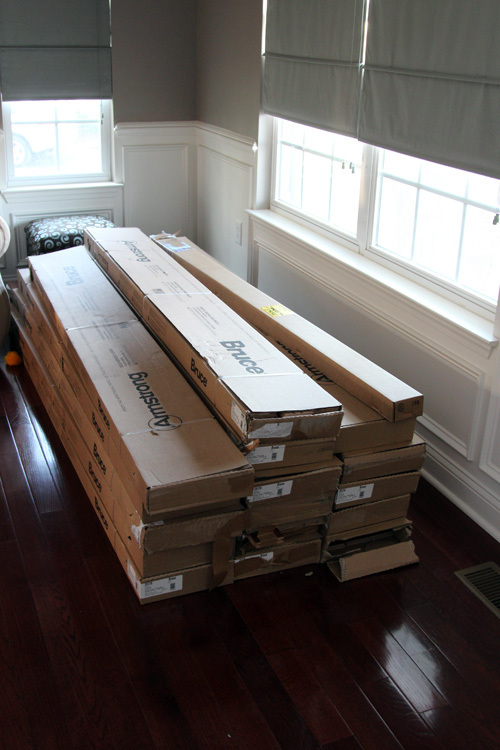 Back to Lowe’s Mike went for another 72″ shelf! He repeated the shelf and rod process on the lower level and we were almost done! Next, the drawers went in… we decided to get 3. 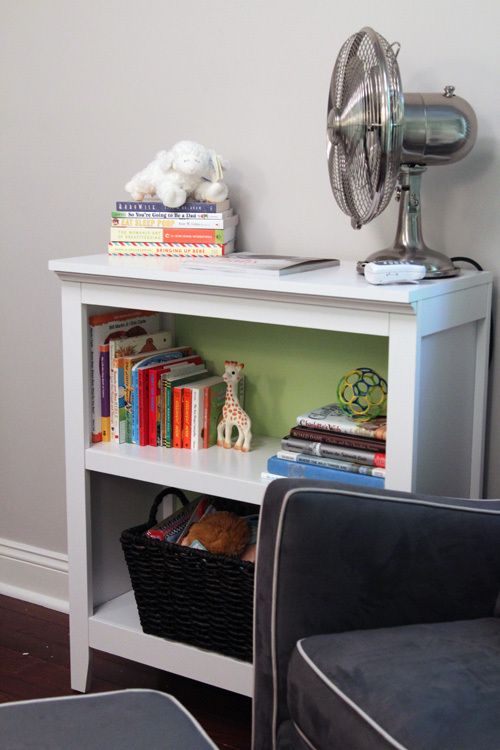 The bottom of the tower can be left as shelves, drawers, metal baskets or a shoe rack. 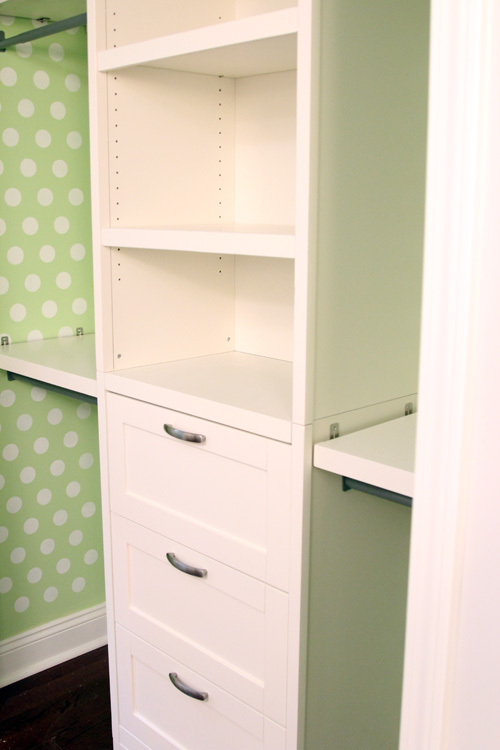 We were going to do just 2 drawers but then decided that the closed storage is more versatile. 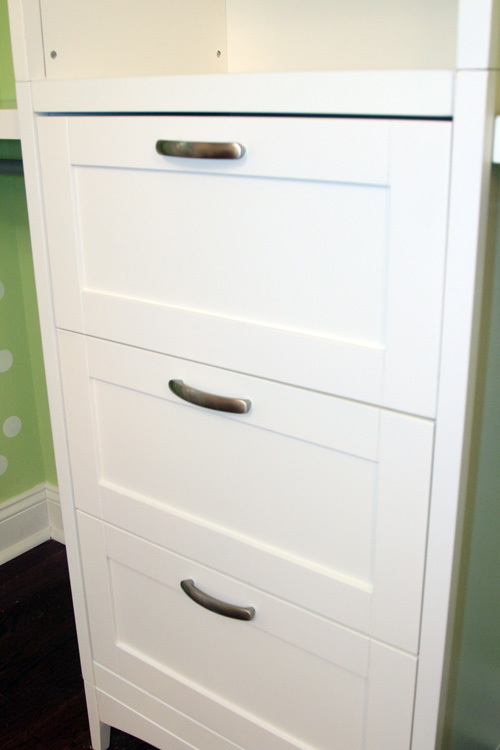 We went with the flat front panel, but Lowe’s also sells a more traditional, beveled drawer front. Oh and for the tower? They give you both a straight top piece and a curved one. This baffled both of us for a while because we wanted the straight piece but all of the boxes had the curved piece on the picture. We didn’t realize it came with both options, pretty clever. We also decided to stick with the hardware that came with the drawers. Why not? We like it. Maybe down the road we’ll go for something more custom, but it’s perfectly fine with me right now. I couldn’t back up to take better pictures because there was a lot of furniture in the way behind me (we were working on hanging curtains on the same day, so things were shifted). I almost forgot to include a picture with the shelves in the tower! I didn’t realize that the zoomed out pictures were taken before we put them in, so here they are! Of course, it took me about 2 minutes to run to the spare bedroom and grab all of the baby’s clothes that have been living in there since we started this. The closet was stocked about 5 minutes later 🙂 I put newborn clothes on one rod, 0-3 months on another, 3-6 months on the next rod and 6-12 months on the last rod. It’s pretty amazing to be nice and organized. In the drawers right now are smaller odds and ends, though the drawers are amazingly deep and have a nice little self closing feature. I fit an entire breast pump (still in the box) along with a bunch of accessories and a nursing cover in one of the drawers. The top shelves are home to some baskets and the tower is currently holding Boppys, a basket and some little decorative items. The bookcase has arrived and I painted the back of it green, only to have the paint not stick at all, so Mike had to coat it with a layer of primer for me (since it wasn’t no-VOC). He finished that tonight so hopefully the next layer of green I put on actually works! I also made some chevron curtains, a bed skirt, made the crib, decorated the changing area and designed some ABC art in Photoshop. 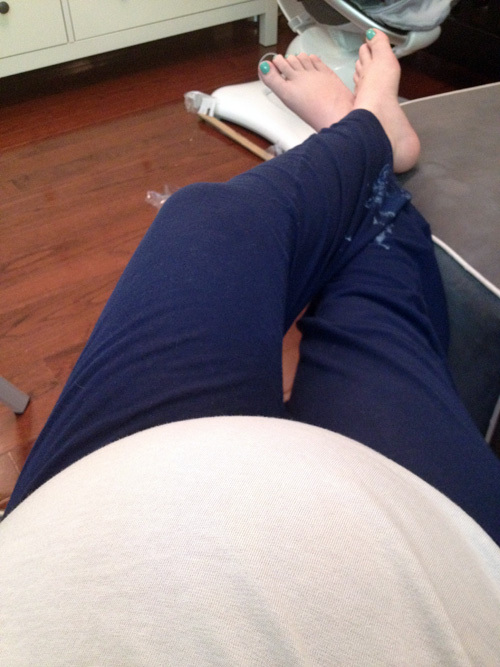 Once this baby actually comes, I can share some real after pictures!